Traveling with a Yoga Mat? HAVE QUESTIONS ABOUT ANY OF THESE YOGA MATS FOR TRAVEL? This super comprehensive guide will help you decide on the best travel yoga mats, so you can stay fit on your travels. Plus, how to choose your mat and useful tips on traveling with a yoga mat. ❶ Traveling With a Yoga Mat? If you’re dedicated to your daily yoga practice, even when you travel, then you’re going to want to know what the best travel yoga mat is. If you don’t want to be weighed down traveling with the everyday yoga mat that you use at home, then you’re in luck because there are numerous travel size yoga mat options on the market designed to be portable, durable and perfect for maintaining your yoga practice when you’re jet-setting around the world. In fact, I recently decided to take a backpacking yoga mat with me on my travels and so found myself searching online for the best yoga mats for travel. I read a variety of the best travel yoga mat reviews which helped me work out what to look for in the ideal yoga mat for travel. I then shortlisted a few before deciding on purchasing the Yogo Ultralight travel mat (which I just love, keep reading below for my full review). 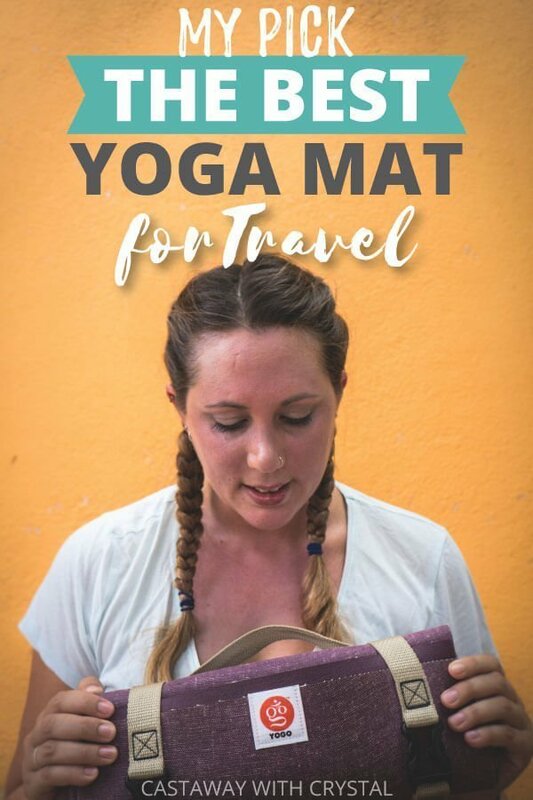 I have decided to put all my research to good use and so put together this guide to help you find the best yoga travel mat in 2019. In this guide I go through the various features you should consider when purchasing a traveling yoga mat, as well as compare some of the best portable yoga mat options currently on the market. In this review, we look at a range of compact yoga mat options from a variety of yoga mat brands. Whether you are after the best light yoga mat, the best foldable yoga mat, the best thin yoga mat or just a good cheap travel yoga mat, you will definitely find it in this guide. Don’t have time to read the entire yoga mat guide? My pick for the best lightweight yoga mat overall is the YOGO Ultralight Travel Yoga Mat. I bought this yoga mat seven months ago and just love it because even after loads of use in the rain, on the beach and on rough and hard surfaces this mat is still amazing to use. It ticks off all of the features you could need or want in a lightweight, portable and comfortable yoga mat. To see reviews and check the price of the YOGO Ultralight Travel Yoga Mat click the button below. I know you are probably wondering how to travel with a with a yoga mat when they are kind of big and bulky? Well, that’s why you need a packable yoga mat because they are lightweight, compact and super easy to travel with. Some of these travel yoga mats roll up tiny, while others fold into small squares, making them super lightweight and portable. They can also become dirty and need to be transported before you have a chance to clean them. This is where a bag for your yoga mat comes in handy for the rollable yoga mats, which I talk more about at the end of this article. For travel foldable yoga mats, you simply fold them in such a way that the dirty side of the mat faces inward and does not touch any of your other luggage. Are you looking for information on how to fold a yoga mat for travel? We’re talking about a regular yoga mat and not a travel-sized mat here, by the way. I can only tell you that I don’t recommend folding a mat that isn’t supposed to be folded. Doing that will make it really hard to get the kinks out when you arrive. Instead, roll it as you usually do and put it inside of a yoga mat bag to protect it and try to strap it to the outside of your backpack or luggage. If that is not possible, a cheap yoga bag should stop it from dirtying anything inside of your luggage and may help to keep its shape somewhat. Keep reading just below to compare yoga mats and to see my tips for deciding which of the top 10 yoga mats for travel is right for you. Check out my easy travel yoga mat comparison chart below where you can see all the main features of each mat side by side to make it easy for you to compare yoga mats. Click the links to see the most recent prices, especially if you are looking for cheap yoga mats, because sometimes products go on sale! YAY! For the full reviews of each yoga mat for traveling, keep on reading below. Before you buy any old yoga mat for travel, here are the 6 things to consider when purchasing a yoga mat for travel. Given you are purchasing this yoga mat for travelling, you really want one that is easy to pack into your suitcase or backpack. Yoga mats for travel either roll nice and compactly with easy to carry handles or alternatively, they fold up nice and small. In the full reviews below, I have noted whether the yoga mats roll or fold, so check it out if you prefer either style. Since you will be carrying your yoga mat around with you, you want something lightweight. This is even more important if you do carry on only luggage. Look for something around 1 kg or less. Most of the good yoga mats in this guide are less than 1 kg – they go from an ultralight yoga mat of 450g through to 1.6 kgs. A travel yoga mat not only needs to be portable, but it must be durable as well. If you’re going to be on the road for a while or travelling to several destinations it is likely that your mat may cop a bit of a beating being unpacked and repacked in your bag. Perhaps some of your yoga practice is going to take place outdoors? In this case, it needs to be able to withstand different surfaces and be easily wiped down or machine washed. Ever wondered; “what size yoga mat do I need” while researching? Given your looking for a travel yoga mat, you are going to have to compromise on size a little bit here but of course, it still needs to be big enough for your yoga moves. You will find that most yoga mats for travel are around 61 x 173 cm. This is a good size for your practice and you can easily put in your suitcase or even in the water bottle pocket of your backpack. I have included the size of all the mats in this review in the handy table above. Do you prefer a thick or thin yoga mat? Travel yoga mats are usually much thinner than your everyday mats to ensure they are lightweight and portable. However, if you are someone who needs extra padding around your knees or knows they will be doing their practice on hard surfaces then you may want to opt for a thicker mat. This review includes yoga mats from 0.45 mm right up to 3 mm in thickness and various thickness’ in between. Check the table above for a thickness that suits you. Of course, above being packable and durable, you want your yoga mat to function well and therefore it needs to have a good grip and be comfortable whilst you complete your yoga practice. To be able to perform your yoga poses with the confidence you don’t have a mat that slips all over the place or one with an inadequate stickiness that has you slipping and sliding. 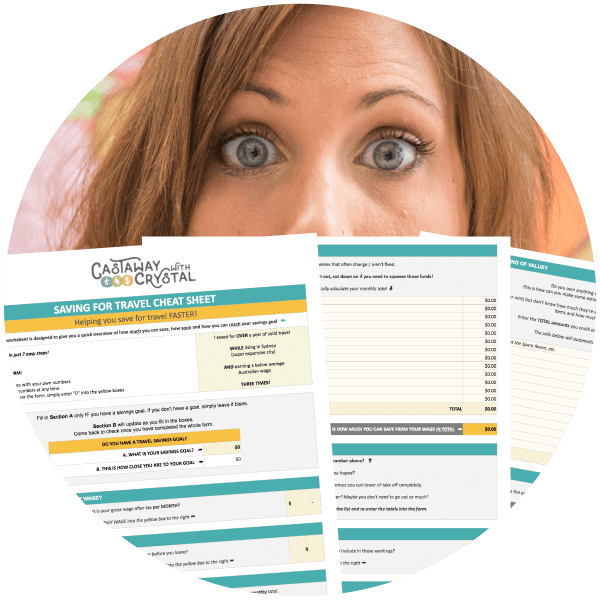 Click Here for Your Exclusive Travel Deals! In this section, we compare and review across all the best yoga mat brands. So, let’s take a look at the best travel yoga mats available. The Yogo travel mat is the mat I have and I just love it! It’s also my pick for the best yoga mat for travel overall, because it’s lightweight, portable and foldable so it ticks all the boxes. It is also one of the best quality yoga mats I have ever used. My Yogo Ultralight Travel Mat review is only full of plusses. These Yogo mats are so compact they pack down to about the size of a newspaper or a large water bottle, perfect for storing on the side of your backpack. At 1 kg it’s also a lightweight travel yoga mat, and an ultra thin yoga mat at 1.5mm thick. Despite being super thin, I still find the Yogo yoga mat provides great support and is plenty big enough for my yoga practice. It also has great stickiness, so you won’t slide around whilst you’re doing your yoga poses. I love how eco-friendly it is too with the sticky material on the mat being sustainably harvested rubber and the company also plants a tree every time a mat is purchased. Some other great features of the Yogo travel yoga mat include the unique origami-type folding making it fit into small bags with ease. Plus the attached straps and clips which keep it rolled up tightly and the ability to wash the mat down is great if you’re doing yoga outdoors. It’s so good, I would say this is best foldable travel yoga mat in this article! This is one of the more expensive mats in this guide, but for me, it still deserves its spot as the best-rated yoga mat for travel overall due to its great features. Despite being one of the top-rated yoga mats online, I also highly recommend the Yogo mat for any world traveler. If you’re someone who requires extra padding for your knees during your yoga practice, then consider the Jade Yoga Travel Mat, one of the thickest mats in this guide. With a thickness of 3 mm, the Jade travel mat is one of the thickest mats in the reviews, which also makes it one of the heaviest at 1.45 kgs. However, it is nice and compact folding down to the size of a yoga block or you have the option of rolling it. Being a thicker mat, the Jade travel yoga mat is certainly cushier than the other mats in this review, giving you extra support for your poses. It is also plenty sticky enough to provide adequate grip. If you want something lighter, Jade also make the Voyager yoga mat which weighs 0.7 kg but is also thinner as well at 1.5 mm. To minimize environmental impact, the Jade foldable yoga mat is made from sustainable natural rubber and does not contain any PVC, EVA, heavy metals or synthetic rubber. And like the Yogo mat, Jade also plants a tree every time a mat is sold. Reading any Jade travel mat review, you will find happy customers. One Jade yoga mat review stated they had used the packable yoga mat daily for 18 months and it’s still going strong. The Jade mat comes in 5 different colours and is also available in two different sizes – 173 or 188 cm long. The Manduka eKO SuperLite Travel Mat is an excellent choice for a super lightweight travel mat at a great affordable price. The Manduka SuperLite travel mat also comes in a whopping 17 colours, so no matter what your preference there is bound to be a colour you love. At only 900 g this Manduka travel yoga mat is one of the lightest mats in this guide, but it still offers plenty of support with a thickness of 1.5 mm. This mat folds up nice and compactly just like a towel, so its super portable and easily packed away in your bag. Whilst this is a foldable yoga mat for travel, there is also the option of rolling it up and attaching it to your backpack. Despite being a thin yoga mat, the Manduka eKO SuperLite travel yoga mat offers plenty of support and just the right amount of stickiness for stability and grip. In fact, reading one Manduka travel mat review one customer reported they found it stickier than their everyday mat and so the Manduka foldable yoga mat soon became their everyday yoga practice mat. This makes it one of the highest quality yoga mats out there. Like all the mats in this guide, the Manduka eKO travel mat is made from biodegradable natural tree rubber and with no toxic chemicals being used in the manufacturing process. While putting together this Maduka Yoga Mat review, I found that if your knees need something a little cushier, the eKO travel yoga mat also comes in the Manduka eKO Lite travel mat version which is 4 mm but also weighs 2 kgs. If you just want the best cheap fold up yoga mat for your travels, then the Gaiam Foldable Yoga Mat is a great choice. This Gaiam travel yoga mat has all the features you need for a functional travel yoga mat. It has a great sticky texture for stability and grip, so you will still be able to perform all your yoga poses without being concerned about slipping all over the place. You will love how compact the Gaiam folding yoga mat is. It folds into a 25 by 30 cm square so is super easy to put in your suitcase or backpack. At 800g it is one of the lightest mats in this guide and yet it still has a 2mm thickness. Reading the Gaiam yoga mat reviews you will note many customers loving this mat despite its cheap price tag. One Gaiam foldable yoga mat review even said they loved how it can easily fit in the laptop section of their backpack and plenty of reviews mentioning the perfect level of stickiness for stability when they perform their yoga poses. 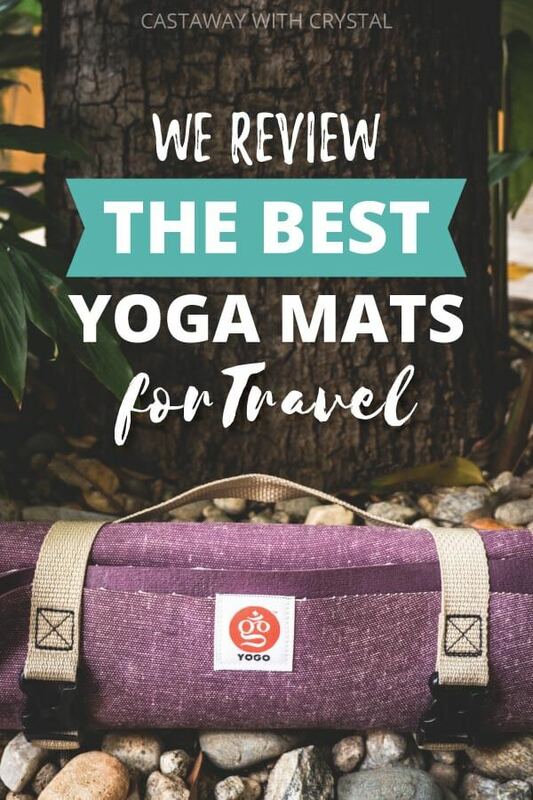 For the price, you really can’t go wrong with the Gaiam travel mat, it really is one of the best affordale yoga mats available. It also comes in a range of colours, so you can choose one to suit your individual style. Yet another great choice for a lightweight and compact travel yoga mat is the Lole Travel Yoga Mat. Lole make some of the best yoga gear out there, meaning this yoga mat is a seriously strong contender. This is a super compact and at 1 mm an ultra thin travel yoga mat. Like a towel, the Lole travel mat folds up super tiny and weighing in at 1 kilo it’s not going to weigh you down during your travels. The Lole mat has a slip-resistant backing to avoid slipping and sliding and the perfect amount of stickiness for grip. Made from 100% natural rubber, this mat is a great choice for travelers wishing to maintain their daily yoga practice. This mat comes in a range of colours too. NOTE: After seeing my Lole Yoga Mat review, I was asked if this mat is the same as the Lole Explore foldable travel yoga mat. I have looked into it and concluded that, yes, the two are almost exactly the same. If being lightweight is a priority for you, then you will love the prAna travel yoga mat. At only 450g, this is by the far the lightest yoga mat in this guide. Despite being the lightest travel yoga mat, at 3mm the PrAna travel mat is also the thickest, so provides plenty of cushion for your knees and hands during your practice. This mat rolls nice and tightly so you can easily store it in your backpack or suitcase. While putting together my PrAna yoga mat review, I found that this mat has a two-sided texture surface and non-slip properties to ensure standability during your poses. It is also eco-friendly made from recyclable materials in a toxic-free manufacturing process. If you want a lightweight mat yet don’t want to compromise on mat thickness, the prAna Nomad travel mat is a natural choice and a one of the top yoga mats in this guide. The Liforme yoga mat might be the most expensive in this guide, but customers are absolutely raving about the quality. Making this one of the highest rated travel mats on this guide. Whilst this is a lightweight yoga mat, the Liforme mat is not the most compact when it comes to yoga travel mats, however, it does roll up nice and compactly. It also comes in its own hand carry bag. The Liforme travel mat has the perfect amount of stickiness for stability. A great additional feature is the “AlignForMe System” which is etched laser markings on the mat. These markings work as a navigational tool to ensure your hands and feet are always in the correct place during your poses. This is regularly mentioned in any Liforme yoga mat review as helping people improve their practice. For the environmentally conscious you will be pleased to know Liforme manufacturers with a no-waste process and they only use a biodegradable natural rubber with no PVC in sight. While putting together this Liforme travel yoga mat review, I found that it is not as compact as other yoga mats in this guide so probably not ideal for those of you who like to travel light. But for those that want a top quality durable mat for their daily yoga practice during their travels, you will love this mat. Headed to a yoga retreat in hot and tropical South East Asia or like to practice hot yoga? Then you will love the Clever Yoga Mat as not only is it light and compact, but it is machine washable too. This yoga mat is made with a soft fabric layer on top to absorb sweat which ensures an excellent grip even if you are super sweaty. There is also the hygienic waterproof layer which acts as a barrier to odors and bacteria. And amazingly, this machine washable yoga mat can be thrown in the dryer too! This is a super compact and ultra-thin travel yoga mat. It folds up super tiny and weighing in at 900g it’s not going to weigh you down during your travels. It has a rubber backing to avoid slipping and sliding and the perfect amount of stickiness for grip. Made from eco-friendly natural rubber, this mat is a great choice for travelers wishing to maintain their daily yoga practice and are also looking for the best hot yoga mat. If you want your mat to look good whilst being functional and compact, then you will love Yoga Design Lab’s Travel Yoga Mat. Available in over 10 different colors, designs, and patterns this will no doubt be the best-looking yoga mat at your yoga retreat (and it’ll look fantastic in those Instagram shots too). Stylish it may be, but it is also a completely functional extra thin yoga mat. Similar to the Clever Yoga mat, the Yoga Design Lab travel mat is designed to work better whilst you sweat. So thin is the yoga mat that you can even use it as a towel to dry yourself off after your sweaty practice. After your session, you can just throw it in the machine and hang it out to dry. Yoga Design Lab even promises the color won’t fade. This is an eco-friendly mat made from natural tree rubber and microfiber from recycled bottles and water-based prints. And every $1 from a sale of these mats goes to support kids in youth yoga programs in need. This is a great compact mat, easily foldable or roll it up compactly and throw it in your pack. Not only is this ideal as a travel yoga mat but also perfect as a travel pilates mat or travel exercise mat. 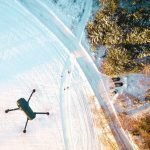 If you prefer a compact mat with extra thickness, then the Khataland YoFoMat is worth checking out, one of the thickest mats in this guide. Despite being a 4 mm thick mat, this is still a super compact mat folding up to the size of a large book making it great for throwing in your backpack or even a large handbag. Weighing in at just over 1 kilo its lightweight too, although it is one of the heaviest in these reviews. The mat provides the right amount of stickiness for grip and stability. It is also slightly longer than most mats in this guide with a length of 183 cm. If you want a compact travel mat but additional support for your knees and hands, the Khatland YoFoMat is a great choice. This mat also comes in a range of colours and its own carry bag. We have compiled a short list of awesome yoga gear to go with your travel mat. ✔︎ Padded Yoga Gloves and Yoga Socks: A great addition to add if your mat is too thin and you find it painful. They fold up small so they are better in your luggage than a thicker mat. ✔︎ Travel Yoga Towel: Can double as a bath towel in emergencies (or hostels). ✔︎ Resistance Bands: Great for a workout while on the road. 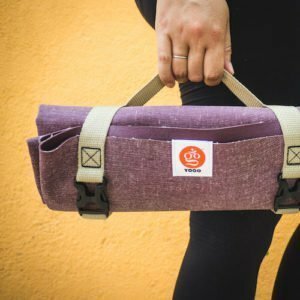 ✔︎ Yoga Mat Bag: So your rolling yoga mat can be easily carried places. It will also protect your mat from becoming dirty or damaged if you keep it on the outside of your luggage or backpack when you travel. ✔︎ Yoga Mat Strap Sling: No room for a yoga bag? The string is much smaller and does the same job! Plus it doubles as lightweight yoga straps. ✔︎ Yoga Mat Wipes: Sometimes it can be difficult to properly clean your yoga mat while actively traveling. Here’s a quick, easy way. I hope you have enjoyed comparing these travel yoga mats as much as we have! Just remember to get the best mat for your needs and you’ll be sure to enjoy your healthy and relaxing time away (in between all of your adventures!) Salud. If you have a question about any of the best travel mats for yoga just let me know and I’ll try my best to answer them! I for sure know it can be difficult to find the best travel yoga mats for your needs.